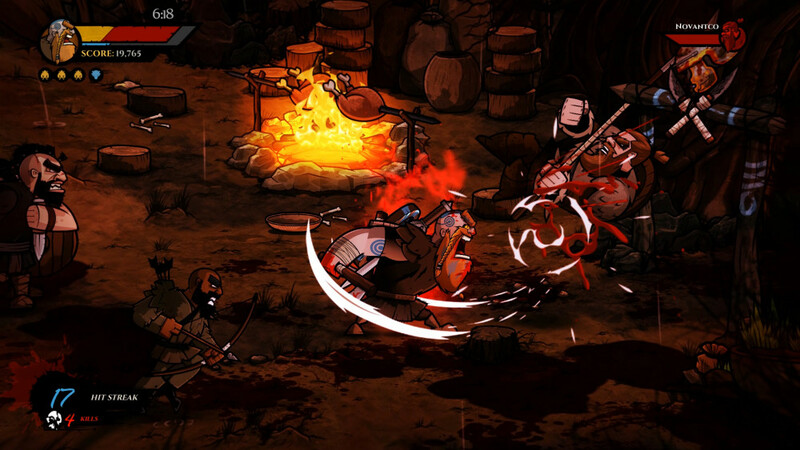 Is Wulverblade the return of the 2D Beat ‘Em Up genre? We definitely think so! As my team and I darted between the traffic at the recent PAX East 2017, one game caught my eye. I can’t tell you if it was the seamless on-screen combat or the fact that it was quite visceral or even that it had local co-op play. Maybe it was all of the above, but it really didn’t matter. All I knew at the time was that I needed to play this and I needed to talk to the team behind this gem. For those saying that they’ve seen this game before, you did. It was actually announced back during Microsoft’s E3 2014 ID@Xbox segment. So it’s been quite some time since we’ve seen the game in action. That game is Wulverblade and after playing with it for a bit and talking to the team behind the game, I can safely say that this game will help fill the void left behind by Streets of Rage and Final Fight. Actually, the game plays very similar to Streets of Rage 2, as it includes special moves and attacks.Double tapping a direction plus a button pulls off a certain move. While pushing two buttons gives you an invincible attack that hits enemies that are surrounding you. On top of that, you’re also able to pull off attacks and combos in the air, follow them up to the ground and continue that. Even at this early stage, the combat and gameplay is very smooth and meaty. Very enjoyable, lots of fun and thankfully, this title does support co-op, meaning you and a friend can battle through the game together. The game, as observed during PAX East, features two modes; a story-driven experience and a horde mode. Just like it sounds, the story mode lets you pick between three characters, each affects how the game is played. While the horde mode has you fighting through waves of 10, with a boss to fight at the end of each wave. During PAX East 2017, the horde mode was restricted to 10 minutes, so we weren’ able to keep going. Though it didn’t really matter as we got our butts handed to us during the 9th wave. Still, it was fun. There’s also an option to enable/disable friendly fire, but for the event it was disabled. I was never one who found friendly fire enjoyable during a co-op session, but your tastes may vary. While you can’t hear it over the noise in the video, the has some impress music and sound. Most of it was epic sounding music, very over the top and enjoyable. After checking with the team, I was informed that team behind the sound/music actually worked on a few well-known films. Films such as Dark Knight Rises, so if you’ve seen that movie, you’ll know what I’m talking about. I grew up on 2D beat ’em up titles and I’ve expressed my frustration that they’re a dying genre over and over. Sure we’ve seen a fair share of them being released, yet all of them have been from indie developers. That’s not throwing shade at the indies, instead but much respect and love. Just wish the AAA studios would get involved again. I’m looking at you, Sega and Capcom. Still, I’m loving that fact that we’re seeing a resurgence and I can’t wait to get some more hands-on with Wulverblade. Wulverblade is scheduled to be released on Xbox One, PS4, and PC. TheThe team has also expressed interest in supporting Xbox Play Anywhere and porting the title to the Nintendo Switch as well. The title will be priced under $20. If you like beat ’em up titles, give Wulverblade a look once it’s released. Expect a review from us once the title is out!